I’m fascinated by Japanese food, but from a position of profound ignorance. I’ve never been there and I’ve never having eaten anything I could definitely say was “genuine,” aside from a wasabi chocolate cake baked by a Japanese friend. So the opportunity to talk to a Westerner living in Japan was one I leaped at. Jason Irwin is a Canadian who has been helping people in Japan learn English for the past seven years. He’s not in a big city, and he is part of a Japanese family, so he probably has a better understanding than many. He’s also leaving Japan soon. Time, obviously, to talk. As I mention in the podcast outro, I still find it rather remarkable that I can be online friends with a Canadian living in Japan and record us having a conversation. The recording bit is nothing special these days, I suppose, but the online friendship is the result of this thing called app dot net, aka ADN. It’s a special kind of social platform, one where the people who use it are the customers, as opposed to the others, where users are just a bulk commodity to be sold to the highest bidder. ADN celebrated its second birthday two days ago, and I’ve been there two years today. I’ve I get a lot out of ADN, not least my conversations with Jason, although I have never done anything to evangelize about it. Consider this a plug. 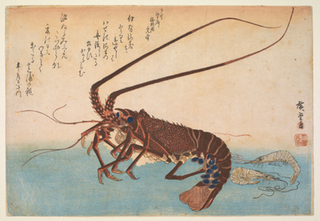 Cover photo is Ise-ebi: Crawfish or Spiny Lobster and Ebi: shrimp by Utagawa Hiroshige. Jason’s website is well worth a read. On food, I thought I would single out two posts about some of the Canadian foods he missed in Japan: Food I miss the most and I am not a chef … but you’ll have to ask him yourself for the details of how to prepare ham cooked in Canada Dry Ginger ale. Aside from everything else that people say it could be, I find ADN to be just a very fine micro-blogging platform. You might too. Banner photograph modified from an original by Linh Nguyen. Really enjoyed the interview. As a Korea born food blogger, writer and living in South Bucks for a long time. Even I lived longer oust side of Korea than in Korea, I still miss my childhood family food so much. This is the very reason, I try to make in UK and an accidental blogger. I understand how he will miss Japanese food when he move to Canada.